“The costs of poor brain health to Europe are enormous. Traumatic brain injuries, mental illness and cognitive disorders are likely to afflict more than a third of European Union citizens – 179 million people. They cost Europe €798bn per annum – more than any other medical area. This is 7 times the €110bn cost of the 2010 Greek financial rescue, and it is every year”. 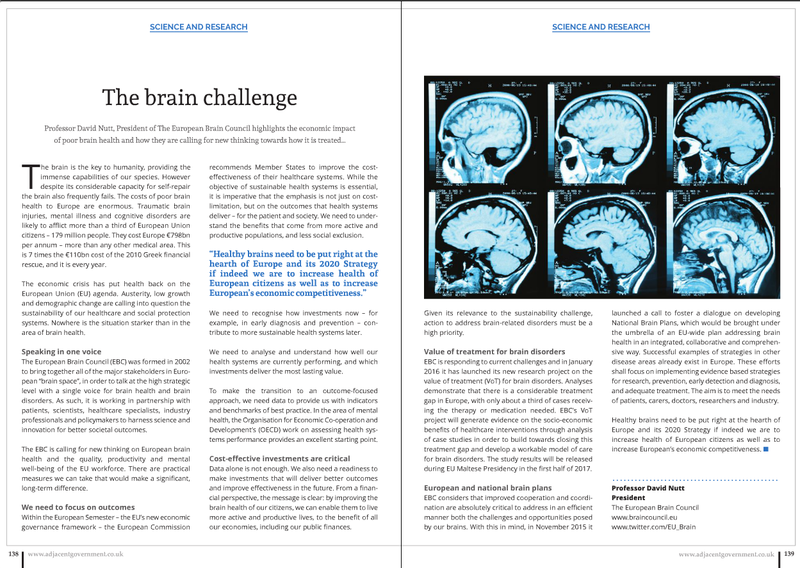 On May 2016 Adjacent Government‘s edition, EBC’s president professor David Nutt highlights the cost of poor brain health in Europe. In this regard, professor Nutt also points out EBC’s action through the Value of Treatment (VoT) project and the call for National Brain Plans, to be coordinated under an EU-wide plan. The whole article can be read here, and the PDF is available for download here.